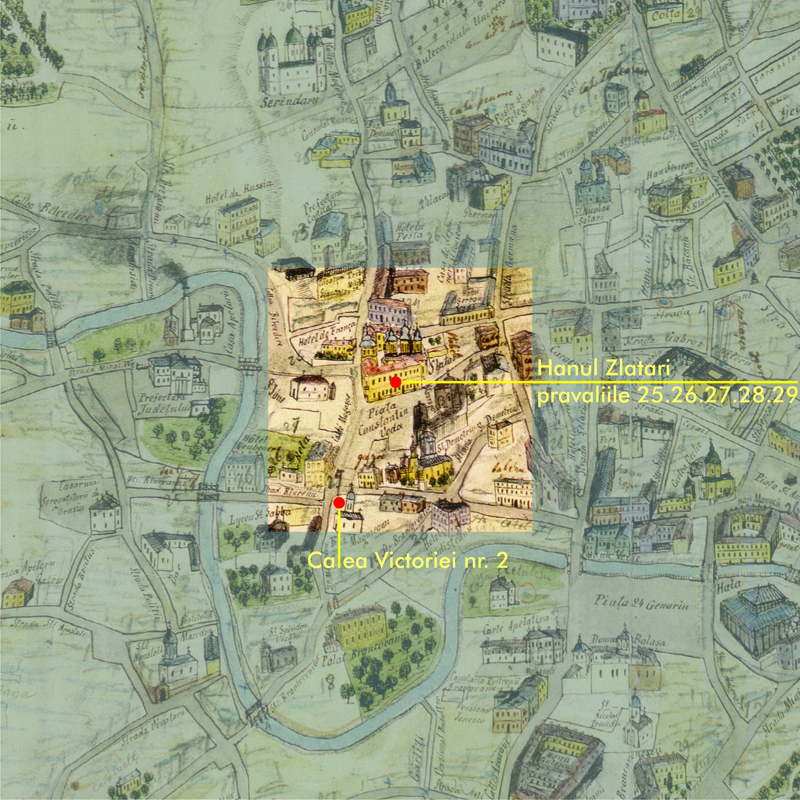 Bucharest City Map, Red Color – 1871In 1879, in 2 Calea Victoriei Str., at the crossroads with Franceză Str., across the Constantin-Vodă Square, there was a Beerhouse, “La Carul cu Bere”, established by Ion CĂBĂȘANUfrom Ardeal (1846-1934 – voluntary in the Romanian Army in 1877). He employed two of his nephews, Ion MIRCEA (1860-1889) and Gheorghe MIRCEA (1865-1943). 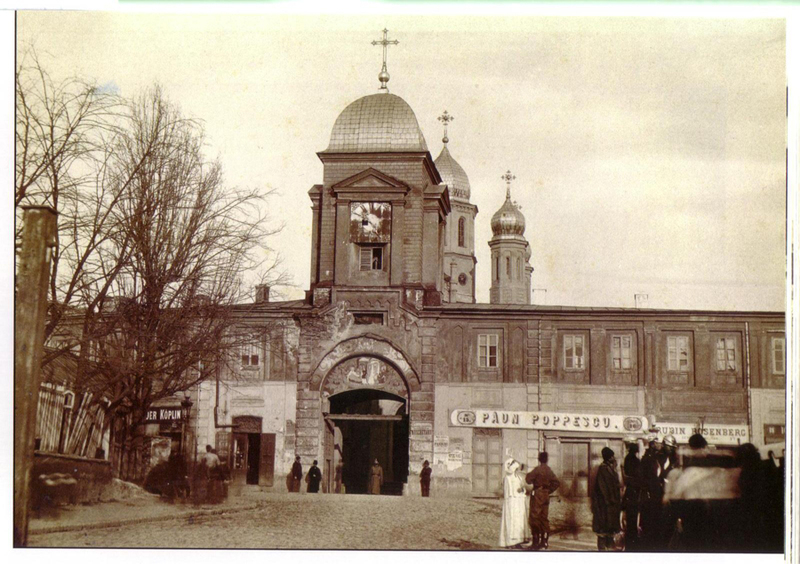 All three of them came to Bucharest from the Transylvanian locality of Caţa (Rupea-Sighişoara Area), that was, back then, in the Austro-Hungarian Empire. The establishment and the owner (Capasin I., Căbăşan I., Cobăshanu I.) 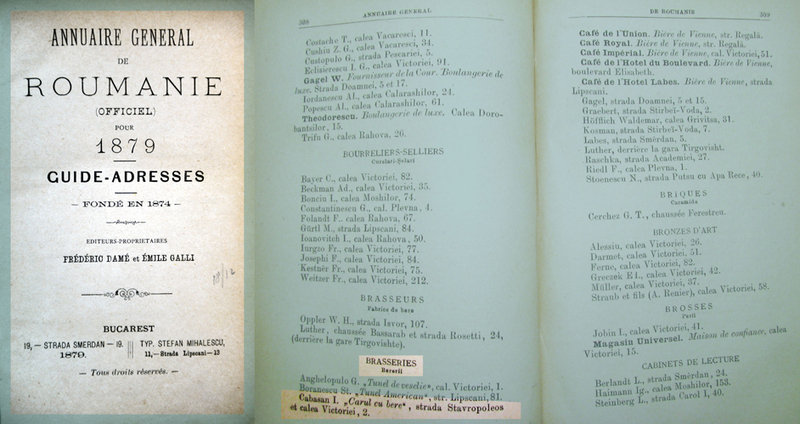 are named in the ”Annuaire General de Roumanie pour 1879”, published by Frederic Damé and Emile Galli. Called by his elder brothers, Ion and Gheorghe, Nicolae MIRCEA (1868-1929) came to Bucharest in 1879. In 1881, after the death of the father Ion MIRCEA (b.1835), the widow Eva MIRCEA (1844-1899 born FĂGĂRĂŞANU) brought his son, Victor MIRCEA (1870-1944), to Bucharest. 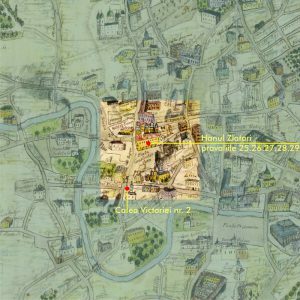 In 1886, the eldest brother, Ion MIRCEA, had already worked for 7 years in the Beerhouse in Calea Victoriei Str., next to the Franceză Str. The 26 years old received a good conduct certificate and, also, the Authorization to become a brewer. Later, he opened a small establishment with 9 tables and 35 seats in 25 Stavropoleos Str. (probably shop no. 25 in the Zlătari Inn). After several years of apprenticeship, Nicolae and Victor worked, as well, in another beerhouse of their uncle, Ion CĂBĂŞAN, in the Zlătari Inn – shops no. 25, 26, 27, 28, 29. Three years later, on March 26, 1889, Ion MIRCEA closed a contract to rent the state carriages – shops no. 26 and 27 in the Zlătari Inn. On April 3/15, 1889 Ion CĂBĂŞANU closed a contract to rent the state carriages – shop no. 25 in the Zlătari Inn. 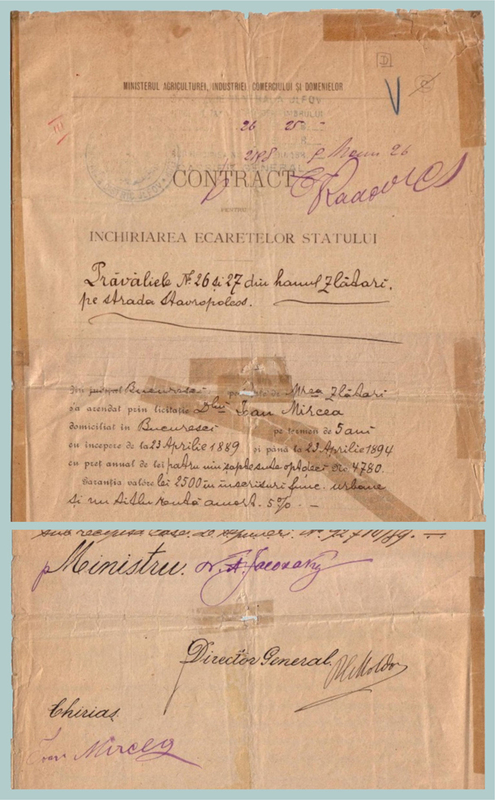 He assigned this contract to his nephew, Ion MIRCEA. The contract was signed by the mother, Eva MIRCEA, and by the two brothers, Gheorghe and Nicolae MIRCEA. Ion MIRCEA, very ill, left for Brașov where he died on July 20, 1889. After the death of the eldest brother, the three Gheorghe brothers were left to carry on the breer trade in the shops (25-26-27) from the Zlătari Inn. They were Gheorghe, 24, Nicolae, 21, and Victor, 19. 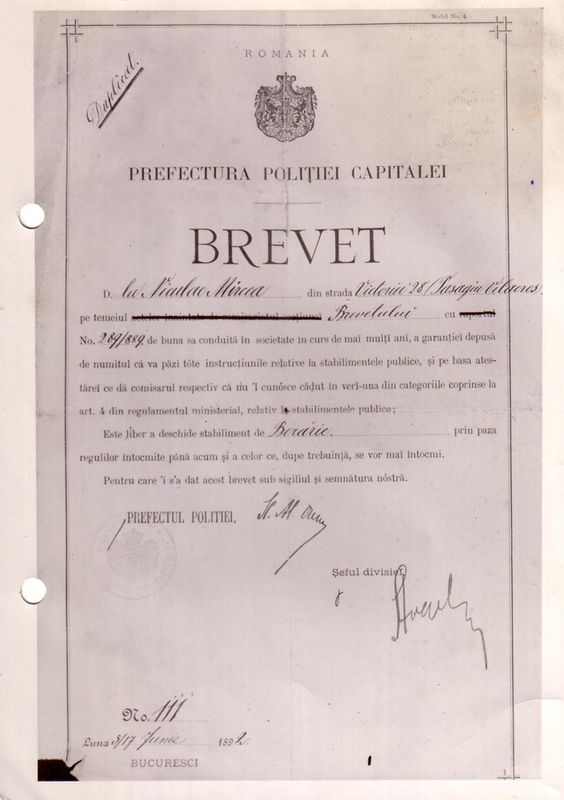 On April 1, 1892, the brewer-merchant, Nicolae MIRCEA (24) is presented by the owners and merchants of Bucharest with a Statement that he had been personally known to them for 13 years (1879) and enjoyed a good reputation and honesty in society. The Statement was to be used to recognize his Romanian citizenship. The Statement was also signed by the Mayor Dimitrie ORBESCU. On May 31, 1892, Nicolae Mircea closed a contract for shops no. 7 and 9 and the cellar from the Villacros Gallery – the National Bank Passage (recently built in 1891 by arch. D.Xenopol). Nicolae received shops no. 7 and 9 – as brewery with all the objects: marble, iron and wood tables, straw, iron and wood seats, pictures, mirrors, glasses, plates and all services required by a brewery. At the end of the same year, on October 25, he closed a Rental Contract for shops no. 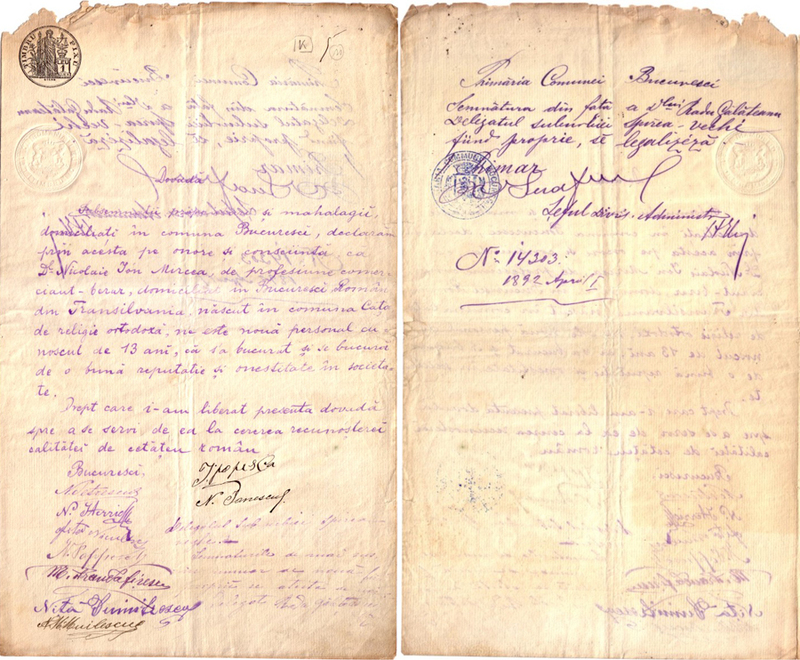 7 and 11 from the Villacros Passage, directly with the owner, Ion Villacros, for 3 years and a half (October 26, 1892 – April 23, 1896). Nicolae MIRCEA is included (as brewer) in the Yearly Catalogue DAMÉ 1891-1892. The activity as brewers-merchants of the MIRCEA brothers is also mentioned in the Yearly Catalogues DAMÉ 1892-93; 1897-98. 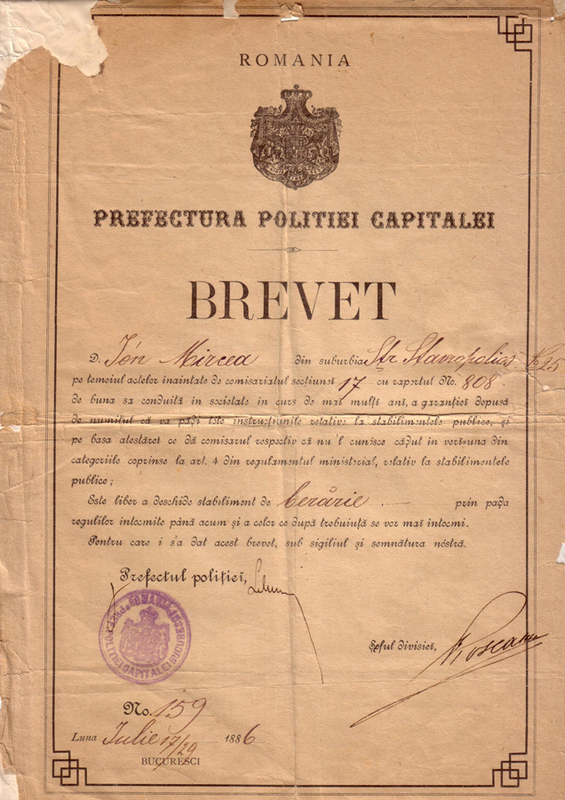 On March 18, 1894, Nicolae MIRCEA closed a Rental Contract for the state carriages: shops no. 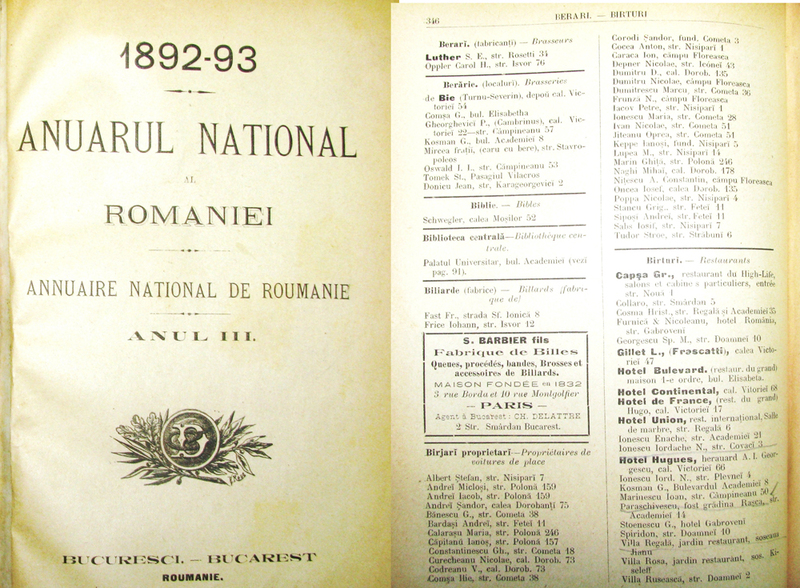 25, 26, 27, 28 and 29 from the Zlătari Inn for 5 years (April 23, 1894 – April 23, 1899). On September 25, 1897, Nicolae MIRCEA, aged 29, bought from W. STAADECKER the place from 5 Stavropoleos Street, (the emplacement of the future building of “Caru’ cu Bere”). At the time, Nicolae MIRCEA was living in 25 Stavropoleos Str. with his two brothers, Gheorghe and Victor, where they also had the shop left by their elder brother, Ion.